Since she left Laban in 2001, Deborah Light has been researching the notions of inside and outside, what is revealed about a person and what is hidden. She would have agreed with the painter René Magritte that ‘There is an interest in that which is hidden and which the visible does not show us.’ Using the body and mind as material, Light is concerned with the deeper layers of the human psyche; the program note for HIDE says it ‘delves beneath our outer shell, revealing internal worlds, and exposing the multiplicity of human nature.’ The three performers (Jo Fong, Rosalind Hâf Brooks and Eddie Ladd) have already marked out significant journeys in dance theatre and their experience is a vital ingredient in HIDE. They work close to that boundary of fearful and fearless, following the notion of abandonment of inhibition as a way forward. The three meanings of ‘hide’ are printed in the program and become immediately apparent in the auditorium: Fong stands naked on a pedestal on stage as we file into our seats. From our darkened hide in the audience we see her hide that she cannot hide. She may be shivering from the cold air, but she is definitely out of her comfort zone, and we witness her struggle as she experiences that psychological barrier between clothed and unclothed, private and public. If she cannot hide her body, what is she revealing? That metaphysical question — and its obverse — is a central theme in the work. While Fong is on her pedestal, Ladd is kneeling with her back to us writing on the floor something we cannot read (and which she later rubs out) and Brooks is facing the back corner crouching in her underwear on a loudspeaker. All three women are materially visible, but their internal worlds are obscured. In the course of HIDE these three charged characters collide like atoms in an accelerator releasing in the process facets of their own inner worlds that interact and reform as new layers of experience. There is an element of Huis Clos here: three characters confined in one space without the possibility of leaving. The stage (designed by Neil Davies with lighting supplied by five mobile studio lamps manipulated by the performers) is their cell, and over the course of HIDE their initial detachment breaks down into a mutual dependence (as in climbing into each other’s clothes) that is broken only when Fong abruptly announces ‘I’m off’ and leaves. Unlike the Sartre scenario, there is a way out of eternity. The soundscape by Sion Orgon is a driving, frenetic electronic score with a quality of crossed wires that weaves in recorded sounds of children in a playground, distorted voices, dream-like fragments, birdsong, cavernous Morse code, and Bach’s Mass in B Minor. Given its non-narrative, almost random nature, it is all the more remarkable when the score, the choreography and the characters suddenly coalesce to create a moment of extraordinary power and beauty like an ascending mountain path that suddenly opens on to a breathtaking vista. Ladd is describing, with appropriate sounds and words, the cutting up of a carcass, hanging from its two back legs, while we hear repeated snatches of Bach’s Crucifixus from the B Minor Mass that Fong seems to control as she swoons and sings, twitches and falls. Brooks, to whom reality is revealed through her olfactory sense, is endlessly sniffing around like a fly around the carcass. Magical. Ladd puts in a powerful performance, acting as the central narrator (in both official languages); perhaps it is her personality, or the force of her presence, but she anchors the dramatic action. She weaves aspects of her life story through the work, from the length of her hair over the past decades, to changing her name to learning how to walk like a man — all strategies for hiding, it seems, but she carves her way through the performance with blinding confidence. As she says at the end with quiet determination, ‘I am a Welsh speaking female. I should not hide.’ Fong has a fluid quality — like water to Ladd’s fire — that flows from wild abandon to introspection and Brooks is air, breathing out animal exhalations like a dragon when she is not taking in the scents around her. Fong finally turns the performance on its head, demurring that ‘It’s not me you came to see. 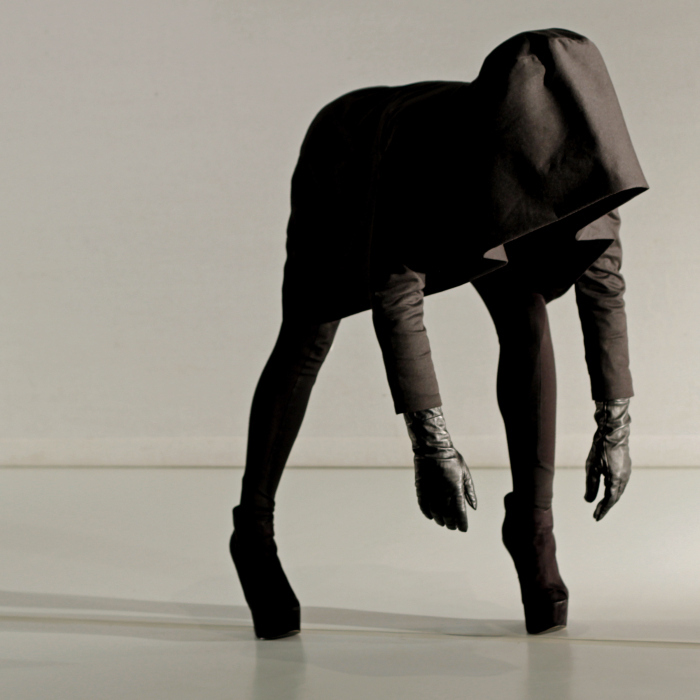 You came to see a show.’ She leaves and Brooks disguises herself as a powerful inert image in black (see the photo above), part animal in platform hoofs and part hooded human. With no further interaction possible, Ladd is left to turn out the remaining lights, one by one, clothing us all in darkness. And with nothing left to see, we leave our hide. What a lovely printed program: well designed by Marc Heatley, with no hype, lovely photography by John Collingswood and just enough text…even if the proof reader missed the printing schedule.